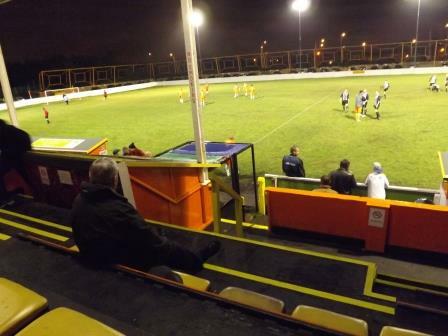 Bilston Town had never appeared on my radar until this year, having been hiding below step six since 2007 – when they went bust. They reformed as Bilston Town (2007) in the West Mids Div Two and, thanks to an appeal to the FA after finishing runners up in Div One, are now back in the West Mids Prem and step six. I had no idea there was such a beauty of a ground nearby that had eluded me until now. I’d actually driven past it before now. I remember thinking I had to go on Google Earth to find out what on earth that stadium was, with floodlights and bizarre orange hypercube faces backing on to the main road were. I’d forgot all about it though, until tonight, when that memory came flooding back. 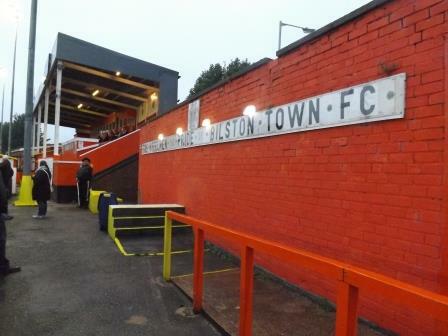 So it was Bilston Town after all. 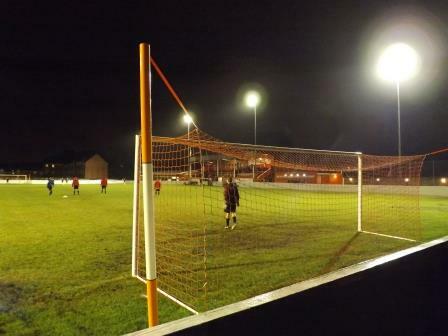 Bilston have a rich history going back to 1894 and spent 17 seasons in the Southern League (midland division). 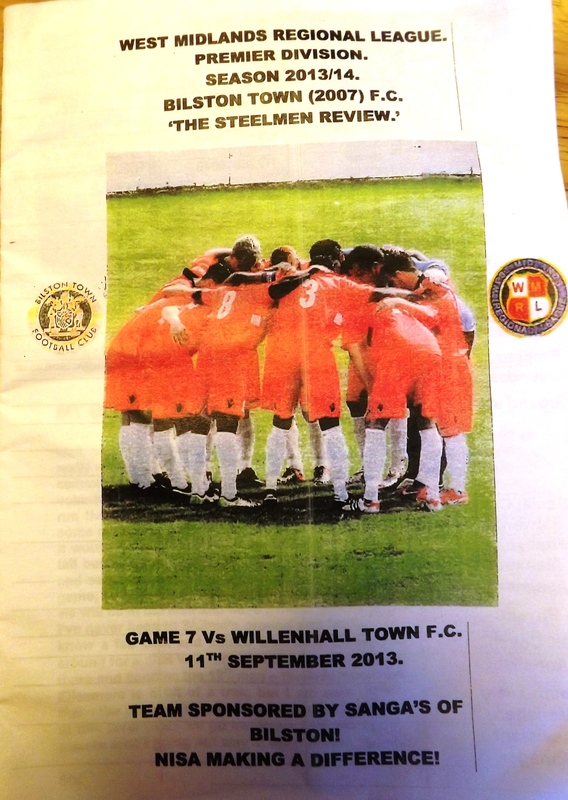 Known as the Steelmen, they have a large and vociferous support for a club at this level. There is even wearing of club replica shirts. The one overwhelming impression one gets, though, after a visit to Queen Street can be summed up in one word – orange. 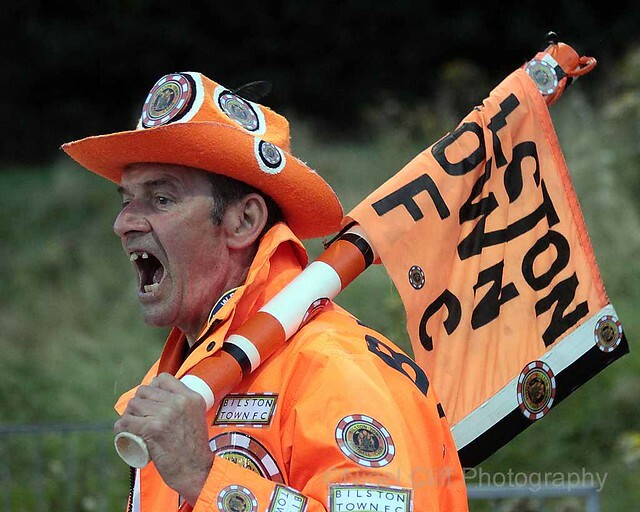 It is exceedingly orange, from the massive retro-font signage outside, to the colour scheme inside, the kit and their superfan, Mr Bilston. It’s right up there with Tango, David Dickinson and David Dickinson’s wife for orangeness and blows Blackpool out of the water. I love a ground that smacks of character, just from the outside. 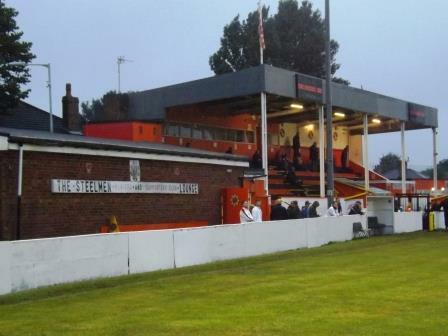 As well as the bizarre (and of course orange) architectural flourish, that adorns the side next to the main A463 Black Country Route, there is the iconic stand and entrance backing on to Queen Street itself. 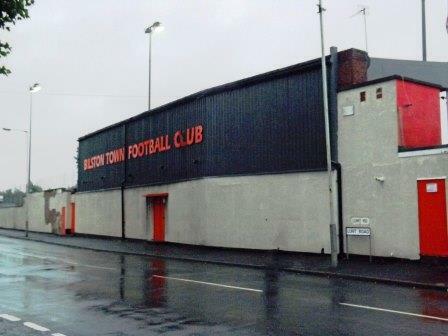 As if there wasn’t enough to feast one’s eyes on, what with all the lurid and various signage, the wonderful main stand and the Bladerunner architecture, there was Mr Bilston himself. Like a manager from a strange parallel universe, he ran the touchline, barking instructions to the players. The stream of shouting (which, it has to be said, was mostly positive) was punctuated with his music-hall style catchphrase of ‘Who’s got who’ (or oo’s goddoo in Black Country speak). He was bedecked in full orange personalised clothing. 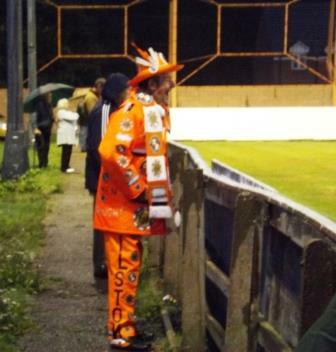 Orange trousers with the letters Bilston transferred down the leg, orange jacket with similar transfers and patches, finished off with a busy Bilston scarf and hat. He plonked a flag right on the half-way line and followed the action, literally, from end to end, always returning to his flag, when the ball went out. Mr Bilston – who’s got who? We stood near to Mr Bilston in the first half, gaining as much entertainment from him as the match. Both sides had made very poor starts to the season and on first half showing you could see why. 45 manic minutes of unforced errors, misplaced passed and mis-kicks. No shortage of effort but little skill or control. Willenhall looked the more comfortable on the ball, though, and were rewarded with a speculative 2o yard shot that crept in under the keeper near the break. 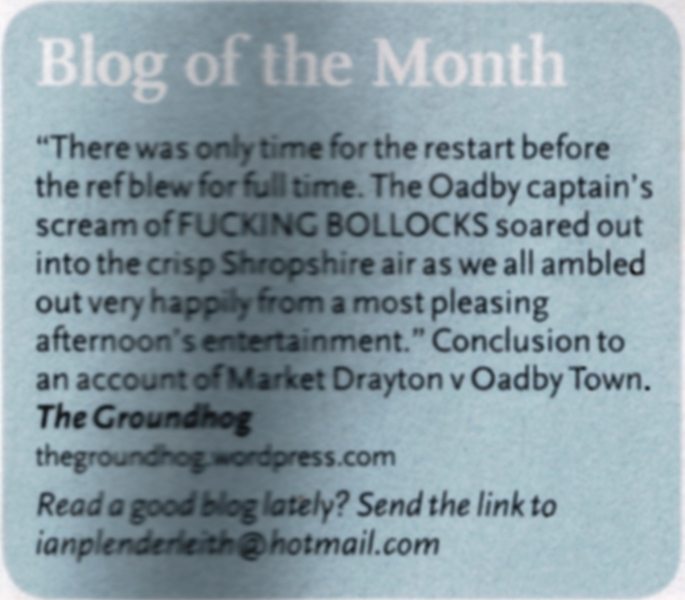 This came 15 minutes after Bilston had a penalty saved. 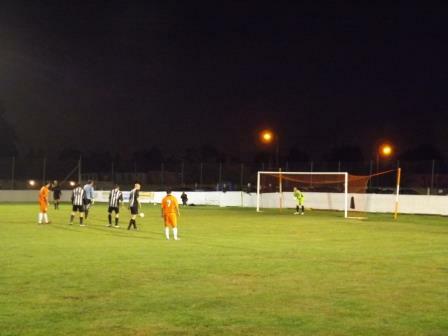 Their huge keeper hit it too near the other keeper – as if the night wasn’t peculiar enough. We sat in the main stand for the second half, amused every time we heard the cry of Who’s got who drifting over from the other side. 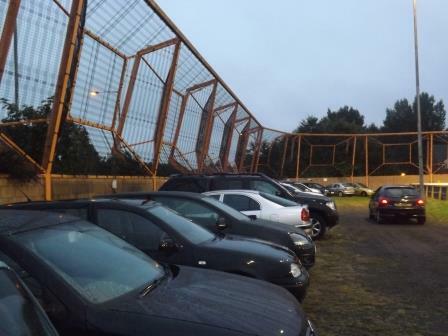 The noisy 100+ Bilston fans got behind their team as they desperately sought an equaliser, while Willenhall tried to seal the victory on the break. It was Bilston who prevailed on about 80 minutes, a bullet header from a perfect cross. 1-1 a fair result. A ground and a game to remember. Mr Bilston looks, frankly, frightening! Can understand how he provided much of the entertainment. Just added a link to this post [highlighting Mr Bilston!] from my latest blog post.